Want to be taken seriously as a freelance writer? Of course, you do! We all do. If you’re anything like the “average freelancer” though, your friends and family might not get what it is that you do. That’s okay – they don’t have to. One of the biggest things that hold freelancers back from success is a lack of confidence. If you question your writing skills or whether or not you can hack it in this business, you’re not alone. We all feel that way at times! 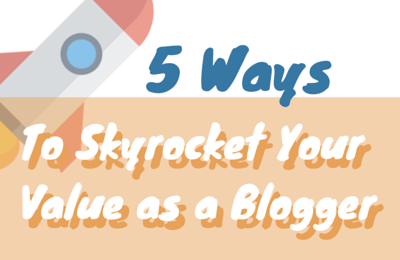 So today I want to share with you five ways that you can skyrocket your value as a freelance writer or blogger. Put these five tips to work and your confidence can’t help but go through the roof! Put your best foot forward with clients on prospects. Be nice, available and make their lives as easy as you can (within the scope of your agreement of course!). There’s a difference between doing quality work and under promising/over delivering and being taken advantage of though. You wouldn’t believe the number of times I’ve heard horror stories from other freelancers about clients that are never satisfied or that are always looking for a freebie or add on at no additional cost. I can honestly say, this has never happened to me. I think that from the beginning, I set clear expectations with clients. If they wanted more than they were able to pay me for, then I would finish up that assignment and cut ties. You control this more than you think you do. Be clear when setting boundaries, deadlines and who owns what part of the project. If the client wants to add something, be clear that there will be a fee associated with the extra work. Lead the conversation and the relationship if you have to – you’re the professional after all! I think it’s okay to work for free or for a less-than-ideal fee when you’re just getting your feet wet. But this is ONLY if you get a byline in order to build samples. Sure you might be getting experience – and experience is great – but don’t let that work take up much more time than you can afford. Instead, get your first few samples and then practice saying, no to low-paying jobs. Or “Can you come up any more than that?” You won’t know unless you ask. It’s okay to also do a trial project for a reduced fee (if you’re really interested in working with that company). But be clear that it’s on a one-time basis only in order to ensure that you work well together. Don’t do free trials, however (unless you get a byline and it’s one of those first few samples to build your portfolio). You should always be trying to learn and grow. If you’re just getting started with freelance writing, feel free to check out my course, 30 Days or Less to Freelance Writing Success. I wrote it to help brand new freelancers get a new web-based writing business up and going inside of a month. Don’t worry, it’s self-paced, so you can take it as quickly as you’d like or stretch it out longer instead. If you’re more advanced, consider some of Carol Tice’s offerings, like the Freelance Writer’s Den. The Yahoo! Style Guide is an awesome book for helping you to learn all you need to know about formatting and writing for the web! One word of caution, if I may? Don’t let learning and reading get in the way of doing though. You’ll never know everything – or probably ever feel 100% prepared. Learn instead by putting yourself out there and doing. Make some mistakes, then learn from them. I guarantee the lesson will stick with you much longer if you learn it the hard way! Testimonials are great! There’s nothing better than getting a referral from a satisfied customer. For someone that didn’t meet you through a referral though, testimonials are the next best thing. When you’re just getting started, ask anyone that can attest to your writing skills to give you a testimonial, even if they’ve never hired you specifically to write for them before. Can your current or former boss vouch for your writing abilities? An old teacher, classmate or someone from an organization you volunteered with? You can always rotate out new client testimonials for the first few you get, so it’s better to just get started with something (this goes for samples too!). It’d be great if you had 2-3 to showcase on your website to start. Here’s an example of my testimonials page, if you want something to go off of. TIP: Wait at least a month after you start working with a new client to ask for one. Then make it super easy by either copying and pasted a compliment they gave you and ask for their approval to use it along with their online profile pic. The easier you make it on them, the more likely they’ll be to give you one. It pays to make new connections and relationships online. It might not be an immediate payoff, but rather can result in something pretty powerful down the road. Ariel and I ran into each other awhile back. At the time, there wasn’t anything for us to work on together, but we stayed in touch and she asked me a few months ago if I’d be interested in writing for Freelance Freedom Fighter. I jumped on the opportunity, as I remember how sweet she was and I love writing about freelance writing (ironic, no?). We’ve grown our relationship into a friendship and have also started an all-female mastermind group together. We’re both leaning on each other currently to sharpen our copywriting skills too (remember point #3?). Be nice to people – online and in real life. It doesn’t cost you much, but can result in huge dividends down the road! Whether you’re a newbie freelance blogger or a veteran, confidence is key to showcasing your value to clients and prospects. There are many ways that you can skyrocket this value and today I’ve shared with you five specific strategies that can work for you too. Make sure to be friendly and easy to work with, but don’t allow clients to take advantage of you. It’s okay to get underpaid in the beginning if you’re getting your first few samples, but don’t let it continue beyond that – value your time and your worth and say NO to low paying gigs. By being selective in your writing assignments, you’ll have both money and time to reinvest into your writing education. Make this a continual process, but not so much that it keeps you from taking action. When clients are happy with the work you’ve provided, ask them for a testimonial. Make it as easy as possible on them and build up a nice page of happy customers to show to prospects. Lastly, don’t forget to build relationships with others online. Support them and they’ll support you. Heck, they might even give you writing work down the line, like Ariel did for me. It pays to be nice! Which of these tips would help your blogging career the most at the moment? Gina Horkey is a writer for hire, with a background in personal finance. She also offers coaching services and really enjoys helping other freelancers gear up to quit their day jobs and take their side hustles full-time. Please stop by Horkey HandBook and download your free copy of 8 Tips to Start Your Freelance Career off on the Right Foot! I think saying no to cheap work is a big one that new freelance writers need to understand. You’re right when you say as long as you get something more out of the client work, then a lower pay is justified. Whether that’s helping you carve out your niche, or learning from a client about their business side of things. I have a lower paying client, but I’m sticking around because it’s helping me develop a niche in the health and fitness industry. Because of this client I was able to secure better paying clients in the same industry. And that’s how it’s done Elna:-) You’re doing amazing! Keep it up! “Don’t let learning and reading get in the way of doing though” – I’m oh so guilty of this! Learning to segment my time is really helping as is making sure I get important things done first. I loved this part of Gina’s post too :-D. I often find myself sidetracked by a good read when I should be working on something else. The one thing that has helped me is to save things that I want to read later in Pocket and then reading those things in my spare time and over the weekend. Want to Increase Your Freelance Writing Income? Use These 3 Ways to Start Tracking It!